A street in New Delhi, India with crisscrossing power lines shows one of the dilemmas facing the Indian government in its struggle to provide reliable electricity. India and other developing countries have consistently ­emphasized the notion of equity in the climate-change debate, advocating a “common but differentiated responsibility”—the principle that all states are obligated to address global environmental degradation, but not equally so. This approach, however, is fast reaching its structural limitation since a number of countries, including some in the G-77 and the Alliance of Small Island States, are indulging Western lobbies that seek to dilute it and have already hinted at accepting a compromise. Without the full support of developing countries including China, which is clearly distancing itself from the G-77 narrative, India will shortly find itself isolated without enough political weight to continue pushing for the common-­but-differentiated approach. It has to rethink its equity-centric narrative without risking being politically outmaneuvered in multilateral discussions. 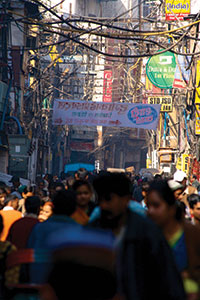 The narrative will need to be both progressive and inclusive, with a focus on accommodating fundamental realities in the implementation framework of the United Nations Framework Convention on Climate Change (UNFCCC), such as the fast rates of urbanization in the developing world, which will inevitably lead to changes in consumption and production patterns. India should adopt a fresh approach to better align its domestic and multilateral commitments before 2015, when a large part of the world negotiates a global response to climate change under the auspices of the UNFCCC. Careful calibration by India’s new government, which was elected in May 2014, requires a series of actions: the articulation of a viable normative framework within which to place its climate-change response, the provision of modern commercial energy, enabling efficiency gains in large companies through market mechanisms, and investment in adaptation. Despite a sustained thrust for energy access by previous Indian governments, elaborate planning has unraveled through poor implementation. Around 300 million Indians still do not have access to electricity, and millions more merely have notional access. While the electrification of a number of new areas has proceeded, the quality of electricity—essentially the number of hours in a day that grid power is available—remains highly variable. Moreover, the new government has to enable an energy transition not just to cater to the nominal needs of so-called light-bulb electrification, but also to enhance industrial competitiveness. For this, it will need to relentlessly pursue all viable energy options. Although India’s energy basket is coal dominated, India does not produce enough of the material to sustain domestic consumption, and even if its development can be accelerated, domestic coal consumption will peak in a couple of decades. In the years ahead, coal imports will add a new degree of fragility to India’s fiscal stability. Even as the government renews attempts to overhaul the coal sector, development of natural gas supply chains—new port infrastructure for liquefied gas as well as pipelines connected to massive gas fields in nearby regions such as West and Central Asia—offers an unparalleled opportunity to scale up power generation. Additionally, unlocking domestic gas potential will also need some bold political leadership as it involves creating market-based pricing mechanisms to attract domestic and foreign investment. Indeed, gas has the potential to become India’s bridge fuel until other alternative energy sources can be mainstreamed. While gas presents an opportunity for the medium term, reaping the low-hanging fruit must be an immediate priority of the new government. Creating the right market conditions can enable efficiency gains in large companies. Simply through demand-side management, energy consumption in the industrial sector can see efficiency improvements of up to 25 percent. Moreover, greater operational efficiency has virtually unlimited potential. Substantial energy savings are possible if financial-incentive mechanisms that employ market forces and reward such efficiency gains are promoted. Templates for such financial instruments already exist, such as the Bombay Stock Exchange’s GREENEX index, which tracks energy-efficiency performance of listed stocks. There is great equity in ensuring that the big corporations in India achieve energy and resource efficiency levels consistent with global best practices. It will also bolster India’s global position as it seeks equity while engaging with the richer and more-developed countries. Perhaps the most critical area for India’s response to climate change must be adaptation. It needs to invest in actions against the imminent threats posed by climate change irrespective of how the global discourse progresses. Investments must be made through innovative channels, using a mixture of capacity-building programs, awareness campaigns, traditional solutions, and new technologies. A good example of an appropriate adaptation response would be to look at areas such as the financial engineering of insurance products to protect farmers from erratic weather patterns. It is already clear that the new government is likely to rely on sustained economic growth as the primary instrument for responding and adapting to climate change. This, of course, has its own set of implications for India’s emissions, which are likely to increase before stabilizing in the long term. The twin objective for the government in New Delhi must be to peak India’s emissions as quickly as possible and to keep the peaking emissions as low as possible. Therefore, at home, India will largely need to focus on rapidly building up generation capacity, using efficient coal-mining and combustion processes, exploiting opportunities that natural gas offers, and investing in green technologies and efficiency gains. At the global level, India must ensure that the 2015 negotiations do not impede its ability to offer a better life to its people or make the cost of the provision of lifeline services too steep. Both agendas must be pursued simultaneously. Samir Saran is a senior fellow and vice president at the Observer Research Foundation. He has diverse experience in the Indian private sector and was actively engaged with regulators and policymakers during the 1990s as India undertook economic reforms. Saran held various senior positions at Reliance Industries, India’s largest business conglomerate. An electrical engineer by training, he has a master’s degree from the London School of Economics and Political Science and has been a fellow at the University of Cambridge.